Hmmm, that'll melt your icicles, eh? Those of you who've been reading along here for awhile might remember my month-long event last year called Antholopalooza -- wherein I read and reviewed a whole bunch of anthologies and shorts; hosted a couple of guest posts; did a few thinky pieces about anthologies and included a number of T-13s along the way. Ultimately, I couldn't bring myself to love the format enough to repeat the experience, but I do still pick one up here and there. Frankly, I think the anthology is a dish best nibbled upon, rather than binged. Then, a recent conversation (see comments) with Jackie over at Literary Escapism got some creative ideas flowing. So here's the deal: Starting in December, Jackie and I will be co-hosting a Mr. Linky meme for short-story-related posts, which we are dubbing Short Story Saturdays. You can review a single short piece, a whole anthology, or post about your love or hate for the format. You'll find mostly romance from me, mostly UF from Jackie, but YOU can choose a short from whatever genre you please. Whatever tickles your fancy-- if you're the type who picks up an anthology and cherry-picks only your favorite authors to read, this is perfect for you. Just review the one story you liked the best (or worst!) and don't feel obligated to finish the whole thing-- I mean, how exactly would you go about reviewing one of those Mammoth books anyway? Makes my eye start twitching a little just thinking about writing -- or reading! a review that long. Because I am lazy and can't be trusted to maintain any given event EVERY! SINGLE! WEEK! and also because I am totally noble and wish to share the work glory with Jackie and ALSO because it was an idea jointly inspired, Jackie and I will be sharing this dealio. We're officially kicking off December 5th, here at Alpha Heroes. In January, Literary Escapism will take over, and we'll be alternating months from there out. Watch for the cute badge that Jackie whipped up, in your choice of purple or green, and feel free to lift it for your post. 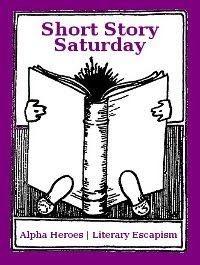 Jackie gives you her introduction to the whole thing here: Short Story Saturdays at Literary Escapism. Now, it *IS* Thursday (in most places, anyway) and this seems like a pretty good spot to put up a list of this year's most tempting anthologies, just in case you need some enabling inspiration. Note that these lean heavily to romance, but there's a nice sprinkling of UF in there too if that's more your ticket. Love that cover with the candy cane... makes me think of all sorts of naughty things to do with that candy cane and hunk! Great list of 13. I've read some of them, but not all- yet. Excellent list! You have a few on there that I haven't seen yet. There's four on your list I can't wait to read, but now I have nine others to add to the list. I have an anthology you might like - The Perfect Gift. I was able to get one of the stories for free on Amazon and ended up getting all the stories. It was pretty good. I posted my own thirteen here. Great idea for a meme. I love anthologies too. I've been in on a couple of them at Freyas Bower Publishing. I also have a release out today with three short stories, Triad of Hope. Hope you'll check them out. Oh, thanks for posting that cover picture, because it reminded me that I wanted to add it to my list of stock photos used for multiple covers! Hey! I've read 13 and in the middle of 9 right now! Maybe i should get involved with this.